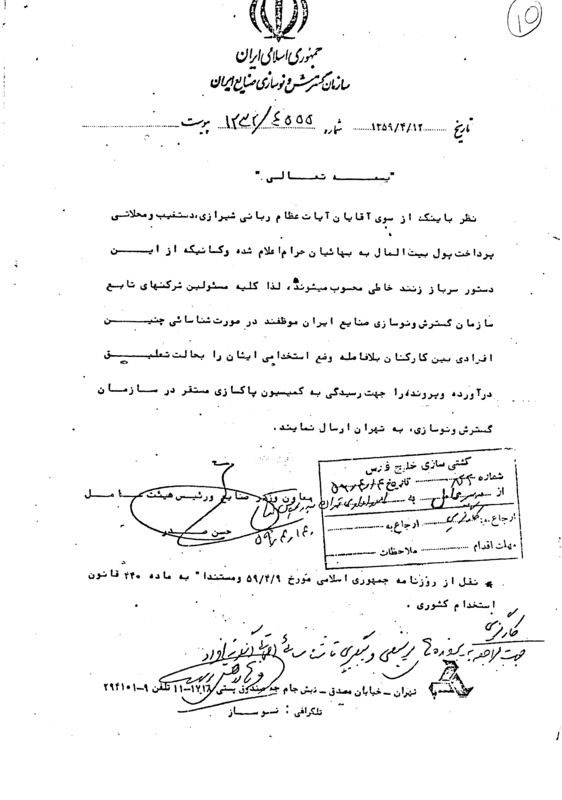 In this document, the Deputy Minister of Industry instructs companies under the supervision of the Organization of Industrial Expansion and Renovation that, based on recommendation by three ayatollahs who made the pronouncement that making payments to Bahá’ís from the Islamic Fund (Beytu’l-mal) is forbidden, the companies are to suspend the employment of their Bahá’í staff, when they are known to be Bahá’ís, and deliver their files to the Purification Commission. Considering that the Great Ayat-u-llahs: Rabbani Shirazi, Dast-Ghayb, and Mahallati have proclaimed that payment of money from treasury to Bahá’ís is forbidden, and those who disregard this decree will be considered as violators, hence, all those in charge of the companies that are under the supervision of the Agency for Development and Improvement of Iranian Industries are obligated, in case of discovery of such individuals among the employees, to promptly suspend their employment and send their records, for processing, to the Cleansing Committee of the Agency for Development and Improvement in Tehran. Quoted from Islamic Republic Newspaper (RoozNameh Jomhoori Eslami) Dated: 59/4/9 [Jul 1, 1980] and based on article 220 of National Employment Law.